Daytona Beach is well-known for its beautiful white sand beaches, family friendly vacations, and its historical reputation as the World Center of Speed, but golf is an increasingly vital part of this Central Florida oasis. 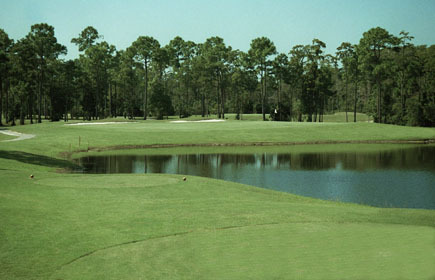 Home to over two dozen quality golf courses, the Daytona Beach area is open for play all year long. The area’s popularity as a golf destination is enhanced by the golf package offerings of the convenient and lovely Homewood Suites, which is perfectly-equipped to host a twosome, foursome or large group taking a golf buddies trip, wanting to enjoy the diverse course offerings at the World’s Most Famous Beach. Homewood Suites Daytona Beach offers studio and two-bedroom suites along with a complimentary, hot breakfast buffet each morning and a cocktail hour each evening from Monday through Thursday. — DeBary Golf & Country Club has been a U.S. Open qualifying site three times and been a U.S. Senior Open qualifying site, a testament to the quality of the layout. Designed in 1990 by Lloyd Clifton, western Volusia County’s premier track, DeBary was created from land that was once an orange grove and runs through a residential community. However, on most holes, houses are hidden by a buffer of trees and vegetation. DeBary plays 6,776 yards from the back tees. Enjoy the magnificent clubhouse after your challenging round.